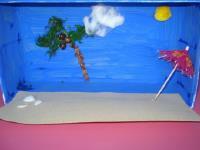 Children will love playing in their very own little seaside décor with figurines. 1. Gather your material. 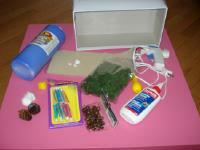 You will need a shoebox, blue poster paint, sandpaper, white glue and/or hot glue, a yellow pompom, a cotton ball, a pinecone, a tiny umbrella (for drinks), tiny seashells, wooden necklace beads, and green material (paper, straw, etc.). 2. 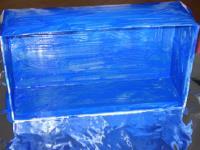 Paint the inside and outside of the box with blue paint. Let the paint dry completely. Apply a second coat of blue paint, if desired. 3. Break the pinecone into tiny pieces. 4. 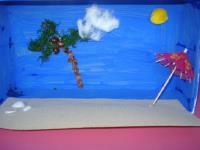 Apply white glue in a curved line as shown to represent the trunk of a palm tree. 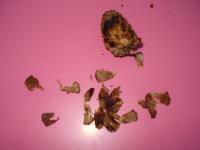 Press the pinecone pieces on the glue. 5. Add your green material to create leaves. 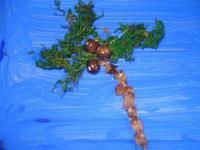 Glue the wooden beads in place to represent coconuts. 6. Glue the yellow pompom to the side (the sun). 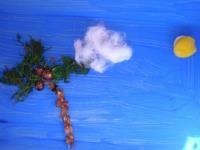 Stretch out the cotton ball to add a fluffy cloud to your scene. 7. Glue the sandpaper on the bottom of the box as shown. This will be the beach. Add seashells and a tiny umbrella. Your beach scene is ready to welcome its first visitors.